The “Celebration d’ Recolte” means a celebration of the harvest in French. 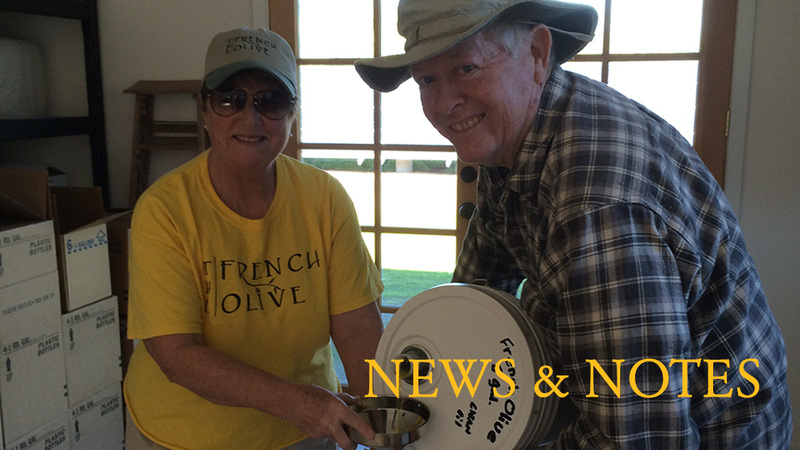 This year we, at The French Olive Ranch, are rejoicing with our largest harvest, to date, and have just released the 2015 oil. The oil is identified by the year in which it was harvested, according to the California Olive Oil Council rules of which we are a member, and thus is labeled “10.2015” for our October harvest time. This “nouvelle huile” (NEW OIL) is at the peak of it’s freshness after a short ‘rest’ from the press before bottling. Right now the oil contains the highest level of antioxidants and polyphenols it will have during its shelf life. The vibrant, fresh flavor will gradually mellow over time, so this stage of the 2015 olive harvest oil is meant to be savored within the next few months. Bon Appetit and Good Health!